And back with part two! WordPress was acting up last night and I kept getting an error when I tried to post this, so sorry for the delay! I won’t bore you all with the long intro like I did last time. 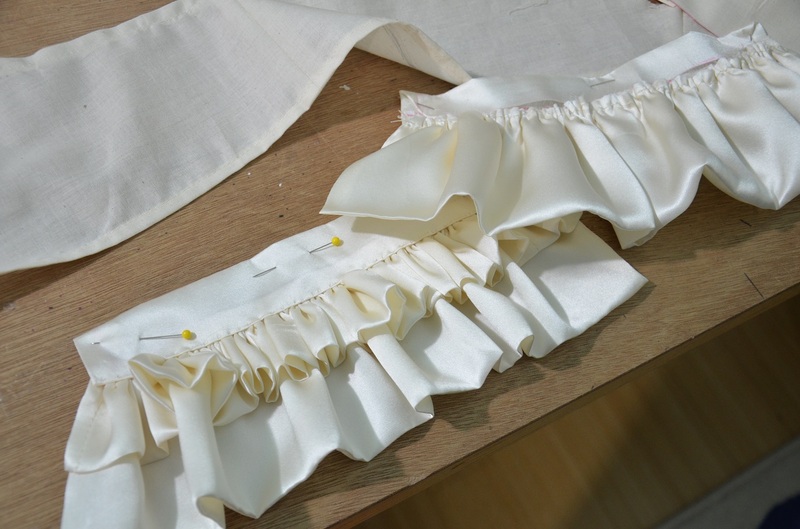 Once I was finished with the collar (which I talk about making in part one) I moved on to the skirt. I cut my skirt to be thirty eight inches long, and one hundred thirty inches wide. 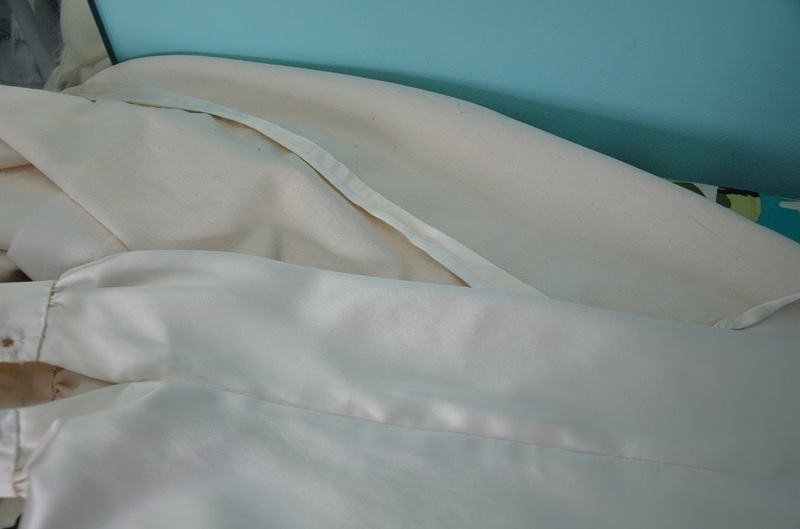 I spent and hour folding and pressing a perfect double half inch hem and pinning it in place. later on that night I spent three hours hand sewing the hem with a slip stitch. 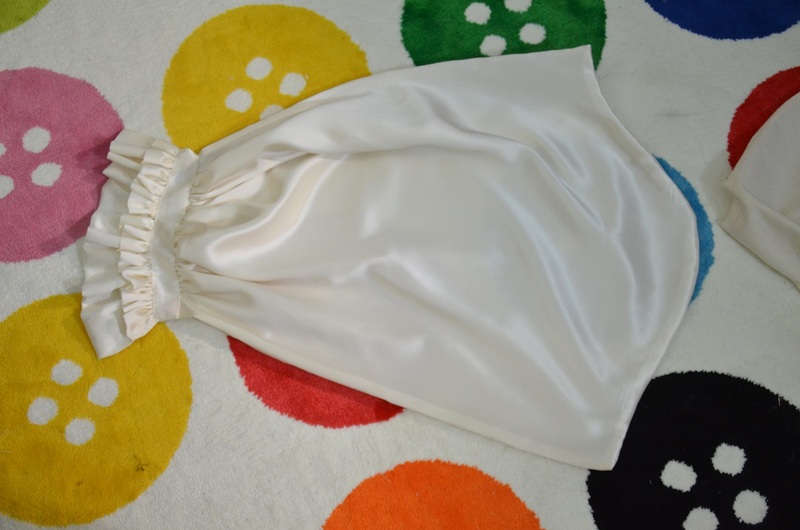 I went very slowly and sewed carefully to avoid creating pulls, or puckering the fabric. Once that was done I pressed it, again, and then began gathering. Each forty five inch wide panel was gathered down to thirteen inches. 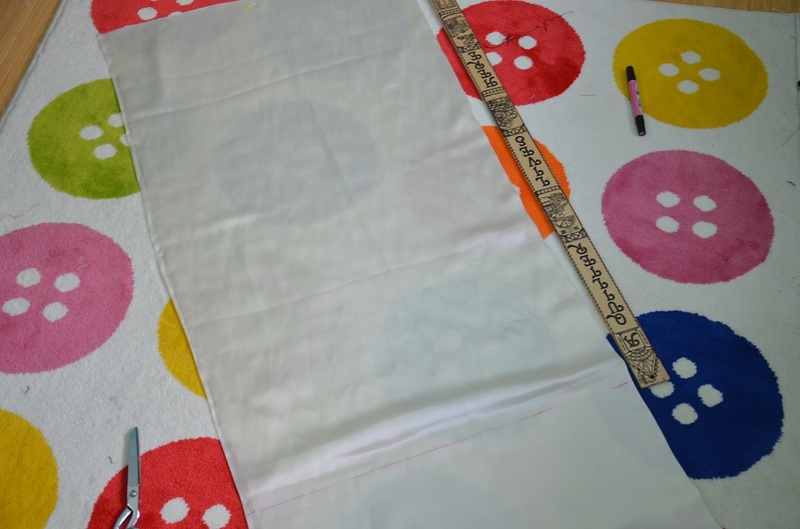 I pinned the giant gathered rectangles onto the bodice lining and sewed it in place. 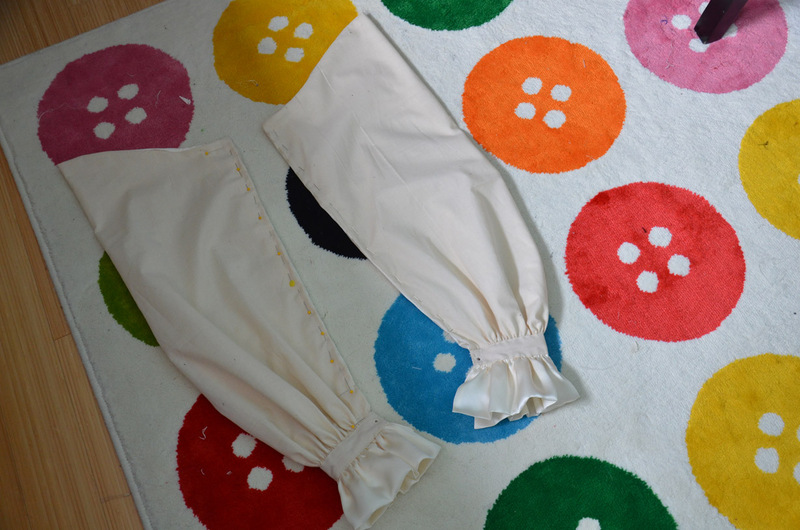 I set that aside and moved on to the next step – sleeves! I started by making the cuffs, since they were the most “difficult” and detailed part of the whole thing. Each cuff is made from three (well four if you count the lining) rectangles of varying sizes. One rectangle makes up the wristband, and the other two are ruffles. I started by cutting the wristbands out (twice) once from silk, and again from muslin. Since I planned on embroidering eyelets on these I decided to reinforce the silk with a lightweight fusible interfacing. 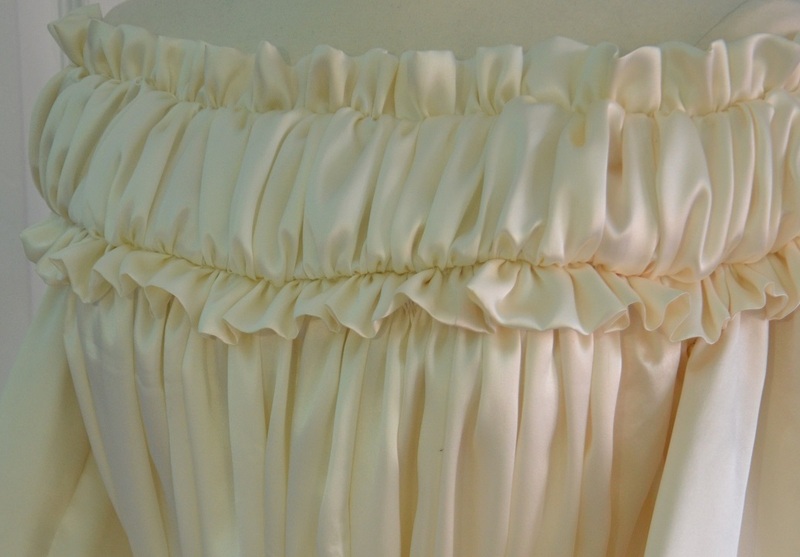 For the first layer of ruffles I cut a single eight inch wide strip of silk. Then I cut it in half so I had two twenty three inch lengths – one for each cuff. I folded these in half and sewed across the tops so they had seamless hems. 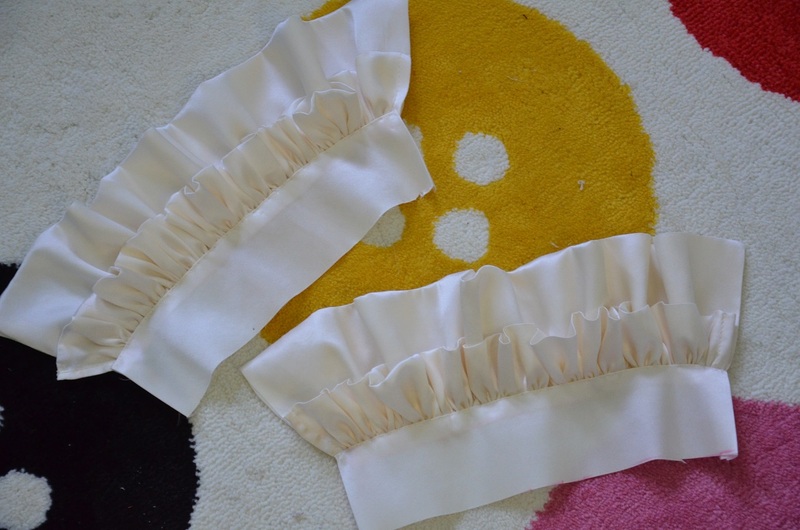 For the second ruffle I used some leftover bits of the folded four inch strips, which were originally used to make ruffles on the collar. 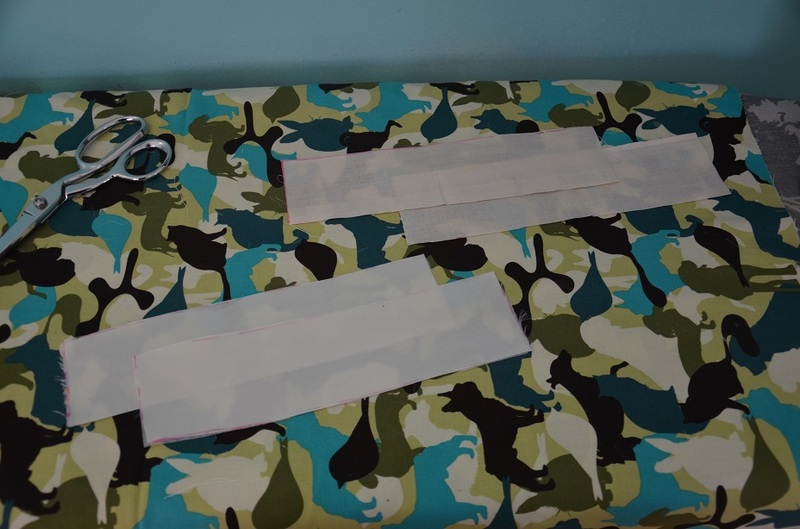 I gathered both strips by hand and sewed them together. Then they were sewn onto the wristband, creating these! I folded the top edge over so the wrist band was an inch and a half wide. As you can see here, the edges are all raw and messy. But before I could fix that by sewing in the lining, I had to make the sleeves. 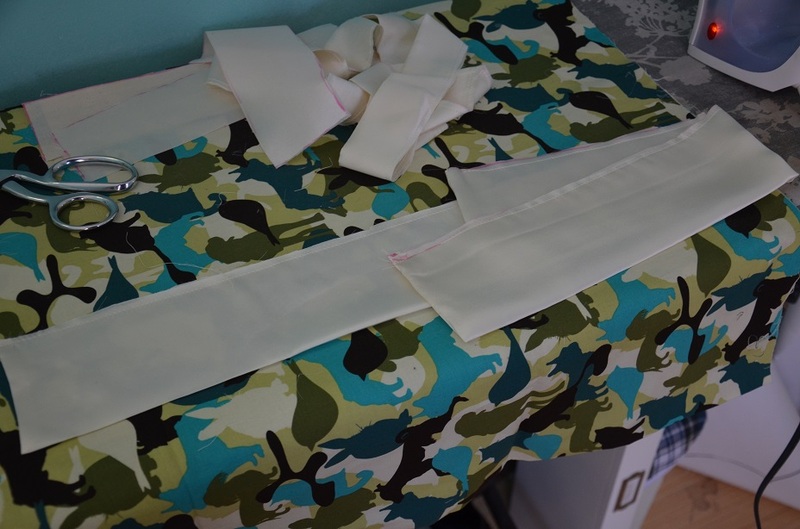 The sleeves weren’t very difficult at all, due to limited amounts of fabric I didn’t really have a choice with how they were shaped which actually made it easier. I drew out the shape I wanted on muslin, folded it in half, cut it out, and that was my pattern. Super technical. 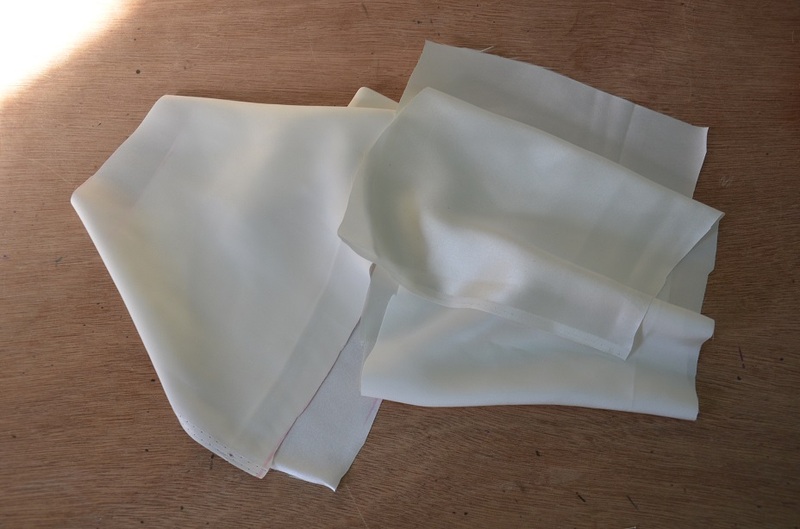 I cut the sleeves from both silk and muslin, then sewed them right sides together. I left the edge that would be attached to the cuff completely open so I could turn the sleeve right side out. 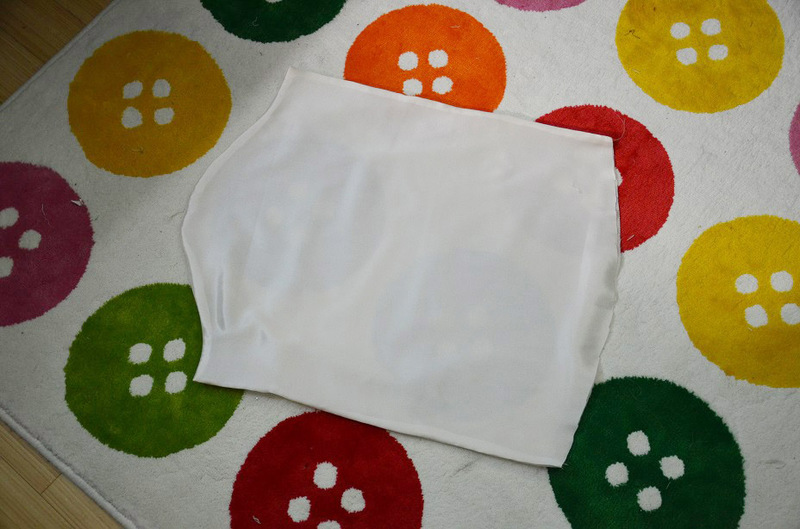 Once the sleeve was ironed it looked like this! I hand gathered the edge that would be attached to the cuff, and stitched them together. 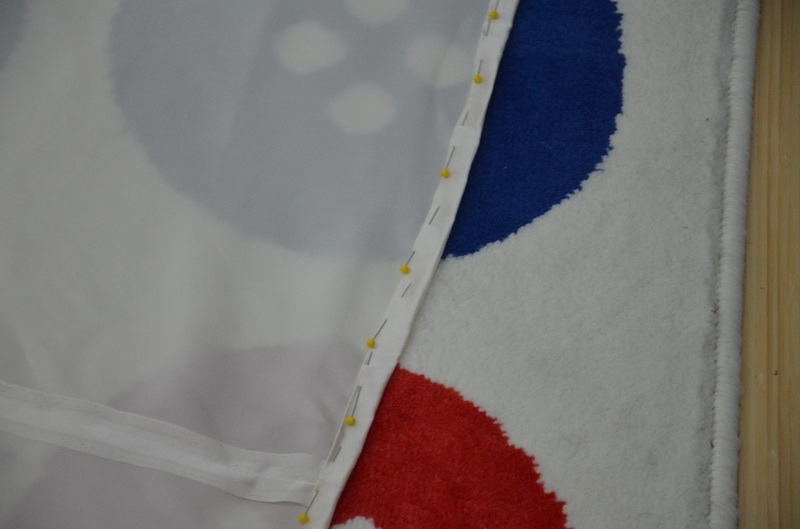 Then I stitched in the eyelets and prepared to sew the side seam up. This is the interior of the cuff, and as you can see it’s finished quite nicely! One of my goals for this year was to really improve on my craftsmanship and finishing skills, and I think in this that shows in this garment. Once the side seams were done up I pressed them open – I was overly excited by this, since it was my first chance to make use of the seam roll, which I bought myself for Christmas. 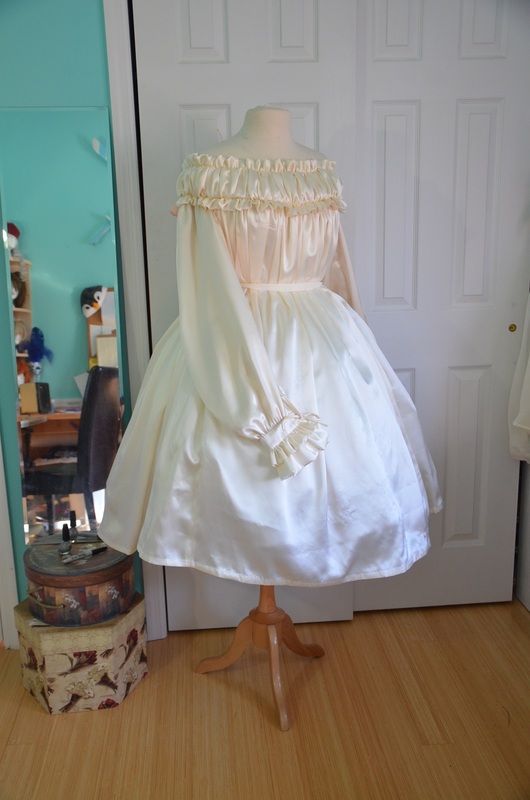 I sewed the sleeves onto the bodice lining. Then I sewed the collar on, and lastly I did up the back seam. Much to my annoyance my memory card corrupted without me realizing it, and I continued to use it which ruined my ability to retrieve the files. So you will have to use your imagination for those final steps! 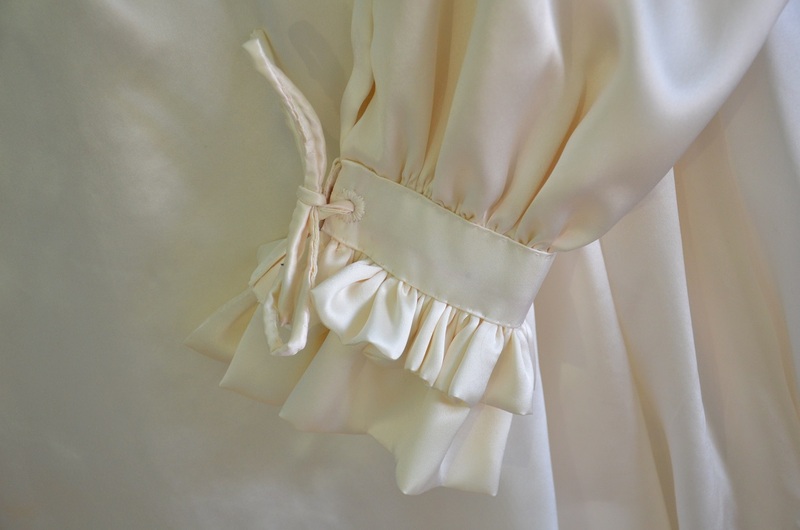 My dressform was decked out with pinned petticoats in progress that would have been difficult to remove,so I placed the dress on top of them and used a scrap of silk to make a waist tie, without it the garment doesn’t have much shape to it. 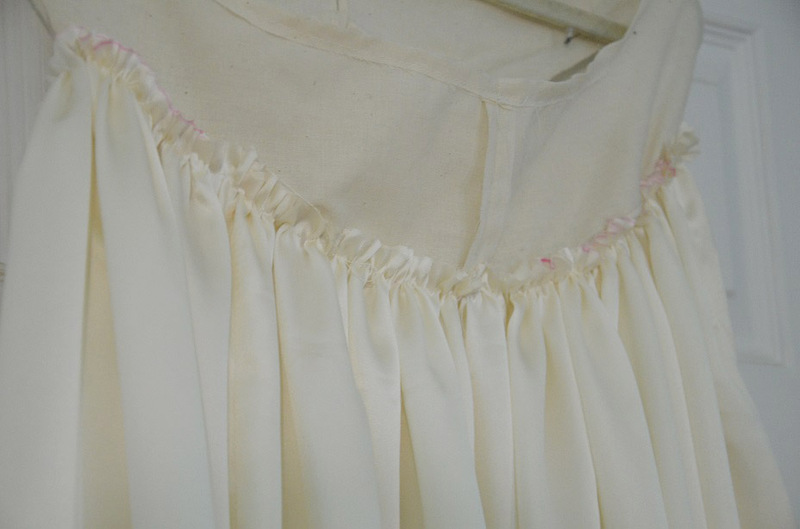 So please ignore the slightly uneven hem – it has to do with the petticoat, not the dress itself! 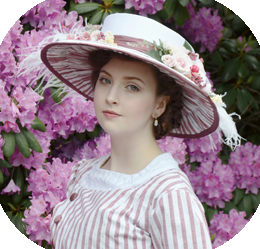 I really enjoyed working on this project – it was ruffly, and simple,but so satisfying to make. I’m really pleased with how it came out, both appearance and construction wise. I would say it’s easily the best finished garment i’ve ever made! Since a few people have asked me how long things take, and how much they cost, I kept track this time! I just now tuned in; I am going to have to look back and see if you made any other posts about this! 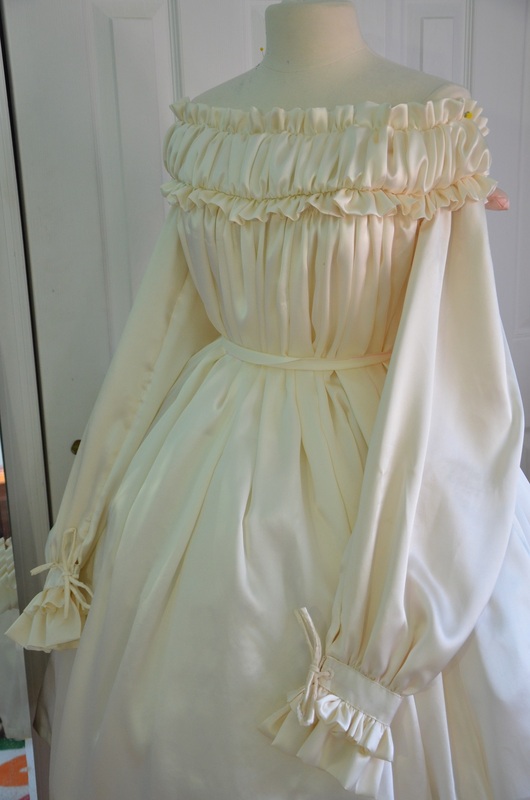 At first I thought you were making a chemise la reine, and then I saw the top and thought mid- 19th century, and now I see it’s a modern dress with historical references! It is very beautiful! 🙂 The fabric you chose is also very lovely. The end result is really lovely! And reffering to your Tumblr page, I’d LOVE to see workspace wednesday videos. I’m a real hoarder myself and I love seeing another sewer’s process and workspace. Keep up the good work! All of these costumes are beyond amazing! I wish I was just half as good! Kudos to you! !